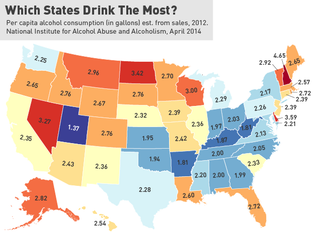 Is New Hampshire Really The Drunkest State In The Union? The National Institute for Alcohol Abuse and Alcoholism (NIAAA) has released its 2014 report on alcohol consumption in the United States, with figures for per capita alcohol consumption updated through 2012. Converting various boozes to pure ethanol volumes, the researchers estimated that the country as a whole drank 2.33 gallons of alcohol per 14-or-older resident, a 2.2 percent increase from 2011. That's a lot of booze: 497 five-percent, 12-oz. beers or 98 bottles of 12-percent, 750-ml wine. The report also broke down the data by state. Utah comes in last, of course, but it's sort of surprising to see just how far New Hampshire is in front of the pack. The state "consumes" 4.65 gallons of alcohol per capita, beating Delaware—the second-booziest state—by over a gallon. This reveals a fundamental weakness in NIAAA's data; they're estimating consumption from alcohol sales, and, as anyone who grew up in Northern New England knows, New Hampshire's state-owned, tax-free, highway-adjacent liquor stores sell an enormous amount of alcohol to out-of-staters. Sales in the last fiscal year totaled $603.5 million; more than half of that came from non-New Hampshirites.